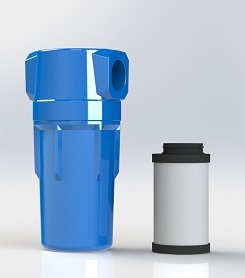 For clean compressed air DS Filtration offers the FP Series of High Efficiency Compressed Air Filters. Compressed Air systems are used in a wide range of industries including manufacturing, food and beverage and automotive. The air that is drawn in by the compressor and used by the system can contain dirt, water, oil and other unwanted air borne contaminants – it can compromise production and become a costly system. Our FP series filters are effective in the removal of solid particles, oil aerosol and water from compressed air systems. 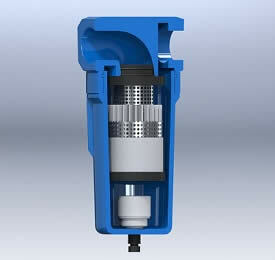 Our filters are a complete assembly that consists of a filter housing, filter element and an automatic drain. We offer ½” to 3” connections and suit a wide range of compressors with a capacity up to 1826 scfm. The DS Filtration FP filter series have been tested to ensure that they conform to compressed air requirements and are safe to use. They are treated to prevent corrosion and have an epoxy powder coating to protect them externally. And our filter elements have a 'Push-fit' design making them faster and easier to install in comparison to conventional elements. We also stock spare parts and accessories for the FP Series Filters including Gauges, Wall Brackets and Internal Float Drains (IDK400B). Not sure what filter you need...whether it be a FP12X1, FP30XA or a FP105XAC we are here to help. The table and diagram below shows the Technical Specifications of the FP Filter Series range for a printable copy please open the following PDF >> Technical Specifications brochure. Technical information below refers to nominal operating condition of 8 barg at 20°C and maximum operating condition: Inlet air pressure at 16 barg, inlet air temperature at 120°C.